When it comes to choosing the right food for your dog, weighing up the options and knowing what to look for can be a difficult task. Today, there are so many commercial diets on the market, each claiming to improve or support this, that and the other, and navigating our choices can be a confusing process. In theory, we shouldn’t need a PhD to understand what’s in our dog’s food but, in reality, we often do. ‘Meat meal,’ ‘animal derivatives,’ ‘hydrolysed proteins’ and ‘digest’ are just some of the ingredients listed on standard commercial dog foods and, whilst we may struggle understanding these descriptions, they are often deliberately vague to throw us off the scent of a low quality food. There is usually no way of knowing exactly what ‘meat meal’ actually consists of; is it chicken, beef or pork? For dogs with allergies, such loose terms can have uncomfortable repercussions. These ‘secret’ ingredients are present in most commercial diets, although their predominance varies from food to food. For instance, many diets will contain a percentage of meat meal because, in small quantities, it is a rich source of protein – in fact, meat ‘meal’ as opposed to fresh meat, is more nutritionally concentrated, meaning less of it needs to be consumed. That said, there will be foods that contain a very high percentage of meat meal and similar, non-descript ingredients, over fresh and wholesome ingredients that are infinitely more beneficial. These cheaper, low-grade foods tend to ‘bulk-up’ their foods with fillers like cereals and grains, which can exacerbate existing allergies and skin problems in dogs. With this in mind, it is important to be able to look at the ingredients list on your dog food and identify whether it is something you want to feed your animal. Is the meat content high? Is the meat fresh, dried or meal? Does the food contain corn? These are the questions you want to be asking yourselves as you select a food. Legally, as with human foods, pet foods must declare all ingredients in order of weight predominance. Therefore, you should expect foods that claim to be rich in chicken to show ‘chicken’ at the top (or at least towards the top) of the ingredients list. The bottom of the list is usually reserved for things like trace elements. However, bear in mind that, just because something appears at the top of the list, doesn’t always mean the volume of that ingredient is high – it could just be higher than the other ingredients listed. Also, be wary of what is written on the packaging; words like ‘complete,’ ‘premium’ and ‘all-natural’ don’t always mean anything and there is little regulation on using them. It is often said that the first 5 ingredients are the ones that really matter. If the top 5 on the food you’re looking at are ‘cereals,’ ‘meat derivatives,’ ‘various sugars,’ ‘protein extracts’ and ‘oils and fats,’ you are probably looking at a low-grade food." If the ingredients list starts promising, with ‘fresh meat’ appearing at the very top, and is then followed by a string of different grains, it is likely that, once combined, these grains will account for more volume than the fresh meat listed above. Sneaky! By contrast, a healthy ingredients list may look like this: ‘boneless chicken,’ ‘chicken liver,’ ‘whole herring,’ ‘boneless turkey,’ ‘turkey meal,’ plus a range of other named ingredients including vegetables and fruits. If the ingredients are listed individually and by name, it means they do not fit into a generalized category of meat and animal derivatives, cereals etc. This is a good thing. Below are descriptions of some common, non-specific ingredients found in many commercial dog foods. Bear in mind that foods containing these aren’t necessarily bad – if all we ever ate was fresh meat and vegetables, we would be lacking in some key nutritional areas! If you need further help decoding your dog’s diet, feel free to contact us with your questions: [email protected] or read our related blog. Meat and animal derivatives - this is a generic term that appears on many pet food labels. The term refers to the fleshy parts of slaughtered animals and their carcasses, which can range massively in quality. The term is deliberately vague so that producers can include the meat from whichever animal is cheapest at the time, regardless of whether it's chicken, rabbit or beef. 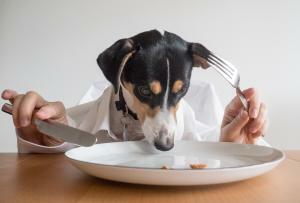 Meat meal - this is a controversial ingredient found in many dog foods. It is defined as the rendered product from mammal tissues, whichever these are, varying greatly in quality from food to food. That is not to say that all meat meal is bad - in fact, it is much more nutritionally concentrated than fresh meat so your dog can consume less of it. Producers don't legally need to specify what mammal tissues are included in their food, which is a worry for some pet owners. Hydrolysed animal proteins - another contentious ingredient that makes its way into many pet foods. Because this type of protein is broken down into smaller components, the dog's immune system doesn't recognise them, meaning it doesn't trigger an allergic response. For this reason, foods containing hydrolysed animal proteins are often recommended for dogs with allergies. In the hydrolysis process, MSG is often formed (a food additive and flavour enhancer), which doesn't have to be declared. Digest - this is a common ingredient found in many dog foods to enhance taste, although the way it is produced is considered controversial. Sometimes digest is listed as 'hydrolysate' because it is formed from the breakdown of animal tissues, or it simply isn't listed at all. It is often difficult to know which part of an animal the digest is derived from, which can put many people off. Common tissues include horns, teeth, hooves and feathers. Ash - a commonly misinterpreted ingredient found in dog food. You may have seen the word 'ash' printed on the food label before and thought of fireplaces and smoke. In actual fact, ash is a relatively good ingredient, respresenting the total of all minerals found in the food. Ash is what would be left over if you were to incinerate the food, including all the fats, proteins and carbohydrates. Minerals left over like phosphorous, calcium, iron and zinc make up 'ash,' which accounts for 5-8% of most commercial dog foods. I think it is totally un-acceptable that pet owners are continually conned by the pet food manufacturers; I feed my dogs Applaws as it is supposed to be a super premium food with 75% Chicken but now I'm being told this isn't necessarily a good thing as too much protein can be bad for your dog??? I have spent hours trying to research dog food but just end up more confused and frustrated because the only advice I can ever seem to find is different manufacturers opinions which is obviously going to point you in the direction of their own food. I have tried talking to my vet but again it seems like they only want me to feed my dogs on the Hills Science Plan, (with a discount if purchased regularly from them), but researching the ingredients again cereals come out on top. How do other dog owners sort out what's best for their dogs?